Now that there is a blog started, a key question is getting some feedback. I've written both the 'hello world' post and something a bit more substantial. What to write for the blog depends on the community as a whole. So feedback on the content would be great. I guess one answer per feedback 'concept' would be best. what i need now is a lesson on how to format it -- same markup as used for the q&a, or something else? -- and assistance in actually getting it posted, with the ability to edit it (e.g., add or change items) as i come across new material. any support for doing this, or objections? any volunteers for checking the content before it's ready to "go live"? It would be great to have the StackExchange login automatically transfered to the blog. Or at least to use an existing wordpress.com login. I know that an "official" link has to wait for the "official" launch of the blog, but it does seem a bit daft that there are no links from the main site. I seem to recall that it is possible for a moderator to put a banner up on the main site for a couple of days. Maybe it would be worth doing that; perhaps after a couple of posts have gone up. How about a TeX.SX blog? What would you like to read in a TeX.SX blog? 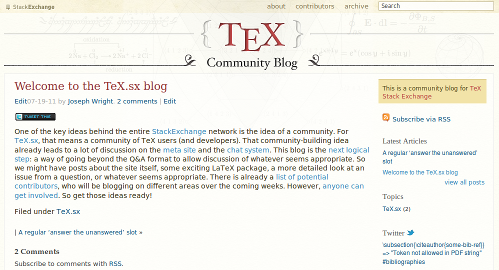 How can I contribute to the TeX.sx Blog? What exactly do we believe about Community Wiki posts?